SP7 is involved with the role of the ECS in the regulation of cellular immune responses in the skin in a mouse model of cutaneous contact hypersensitivity (CHS). One key finding of this subproject is that CB1 knockout mice show enhanced and prolonged inflammation associated with abnormal keratinocyte proliferation and differentiation as well as delayed recovery of the epidermal permeability barrier. These data support our initial assumption that peripheral CB1 receptors on epidermal keratinocytes participate in regulating the inflammatory response in the challenge phase of CHS in the mouse. In a second project we demonstrated anti-inflammatory effects of topically applied THC in wild type and cannabinoid receptor deficient mice. 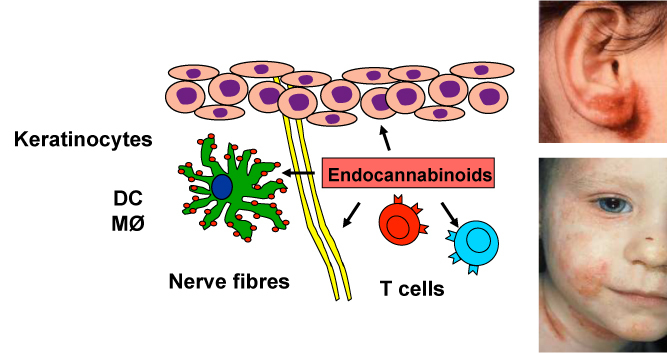 Interestingly, we found that the anti-inflammatory potential of THC in contact allergic ear swelling is in part independent of CB1 and CB2 receptors in vivo. During the second funding period we plan to elucidate the cellular and molecular mechanisms how endocannabinoids modulate allergic inflammation in the skin through CB1 receptors on keratinocytes and CB2 receptors on different immune cells. One question that we aim to answer is why mice with a specific deletion of CB1 receptors on keratinocytes show an increased proliferation, aberrant differentiation and a delayed epidermal barrier repair response. Based on findings of these analyses, we plan to develop therapeutic strategies targeting the ECS to enhance epidermal barrier repair and limit inflammatory processes in the skin in vivo. We will further employ conditional Cnr2-/- mice lacking the CB2 receptor on distinct subpopulations of immune cells to elucidate the anti-inflammatory role of CB2 receptor signaling.